Close to rivers, sea and two national parks. Drive up the valley beneath the high peaks of the Kahurangi National Park towards where the Riwaka River gurgles out from within the marble mountain. Here you’ll find the highly regarded Resurgence – a luxury wilderness retreat perched above the valley floor, bathed in sunlight and surrounded by beautiful native and exotic forest. 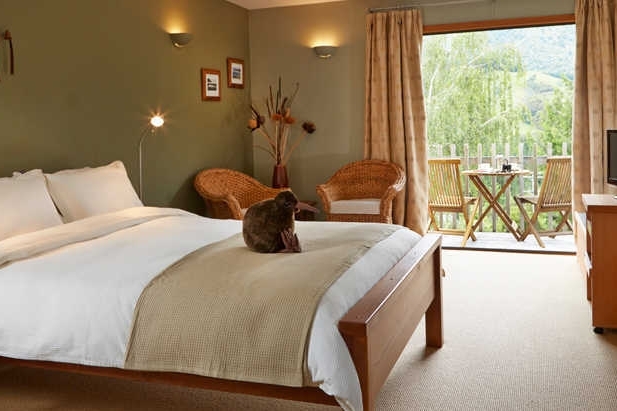 Hosts, Clare and Peter, have created a special place where guests can stay in luxurious rooms in the main lodge or in individual chalets and bush lodges in the grounds. These are also beautifully appointed. Choose to dine at the big shared table d’hote or break out to one of the private dining spaces. Either way you will enjoy fabulous cuisine featuring local foods and wines. This five star eco-friendly lodge is ideally suited for couples, especially those that enjoy outdoor experiences including hiking, mountain biking, sailing, kayaking and bird-watching. The Resurgence is close to the Kahurangi (mountain) and Abel Tasman (maritime) National Parks and is just a short drive from the many activities around the Nelson region and in nearby Golden Bay. Dinner, B&B rate includes accommodation, aperitifs, a 4-course dinner and full breakfast for 2 people. How long do you want to stay? How many people may be travelling? Thank for your enquiry. We will be in touch today.